Our journey to learning how to style kimonos began with an interest in a fashion brand. Last fall, I fell in love with a couple sweaters I saw on IG. Turns out these sweaters were the same brand, Woven Heart. Two Woven Heart sweaters I’ve loved wearing this winter! Julie and I continued to love this brand, and we reached out to them this spring to collaborate. They sent us two super cute short sleeved sweaters, along with several kimonos. Being from the PNW, we weren’t familiar with styling kimonos. We felt intimidated! However, the more we worked with the colorful, beautiful kimonos, we got excited about all the ways we could style them. We ended up being inspired by our kimono outfits! The kimono adds color and pizzazz to a variety of looks. The foundation of your outfit can be simple if you have a colorful kimono on top! Sometimes you might feel like shorts or a short dress are just a little bit too skimpy, especially early in the spring when you don’t have a tan. The kimono adds softness and a bit of length (not to mention style) to these outfit combinations. So pretty with a white dress! It’s nice to have a longer layer when your dress is shorter! The kimono ends up functioning like a flowy, long cardigan for both dressy and casual outfits. Wear it in place of a blazer or jacket with jeans and heels. 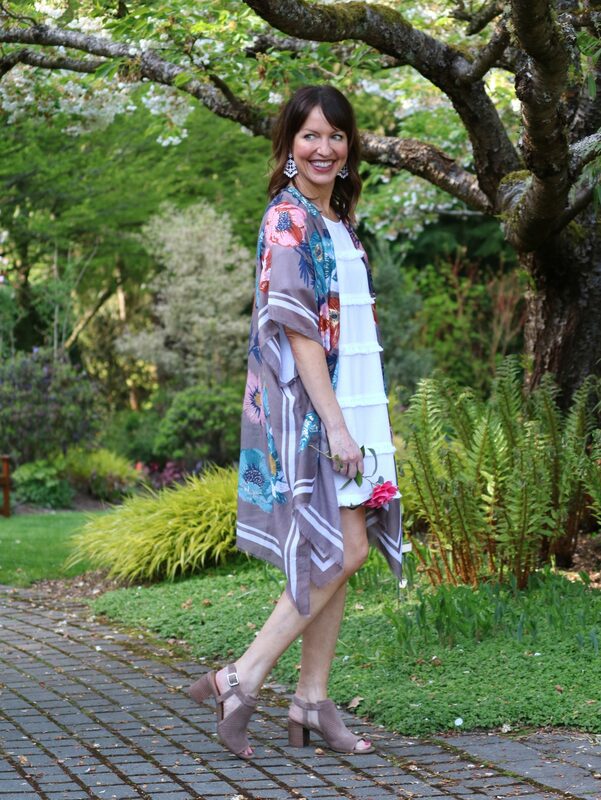 Part robe, part cardigan, the kimono is a comfortable way to add interest to your outfit! So pretty for spring and summer looks! Once again, thank you so much to Woven Heart for working with us, and for sending us these beautiful kimonos. Woven Heart pushed us into styling something different in our wardrobes. 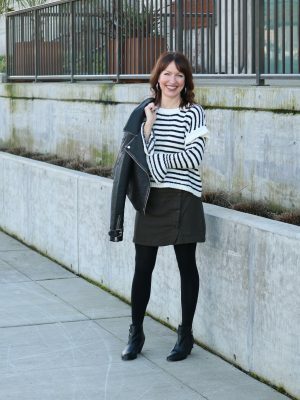 We feel like starting this blog and Instagram page has allowed us to show our fashion sense, and it continues to push us and teach us new ways to create outfits and expand our personal style. For this we are thankful! Next Post wide leg pants trend–yes or no? 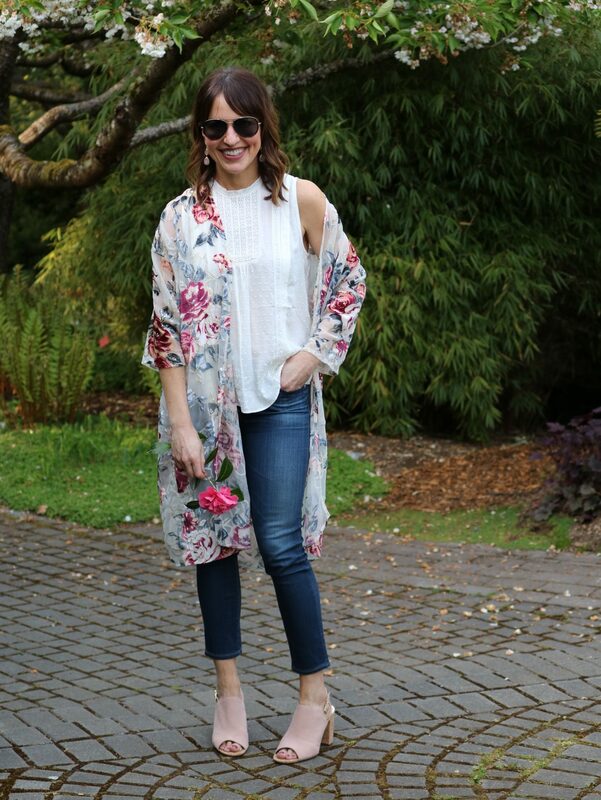 Love all 5 ways you styled the kimonos! SUCH cute looks! Thanks for sharing girlies. I have seen results with all the MaeLove product.